Time to get out of the city for a bit of an adventure in the woods! 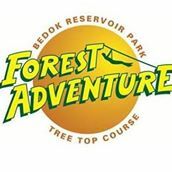 Forest Adventure is basically a rope course built in the trees comprising various obstacles such as ladders, swings, nets, trapezes, and tunnels. The Kids Course for young adventurers has 16 obstacles including a 67m zip line. The expected completion time is 1hr.